This is a looooong article about the world's NO.1 hair regrowth product Minoxidil . For regular customers, it will be more than enough to just read the first part: 30 frequently asked questions about minoxidil (Minoxidil FAQ). If you want to be an expert on Minoxidil, you can read the second part, which is our professional minoxidil review that covers topics (1) how minoxidil was discovered; (2) how minoxidil works to grow hair; (3) How different concentration of minoxidil affect the effectiveness; (4) minoxidil side effects, etc, and more. Part I. 30 Frequently Asked Questions about Minoxidil. Minoxidil is the only FDA approved and most widely used ingredient for hair regrowth as of today. It was first used as an oral drug to lower blood pressure. It was soon found to stimulate hair growth in those who took it to lower blood pressure. Rigorous clinical studies have confirmed this “side effect” and its FAD approvals for hair regrowth as topical solutions were granted (This is very similary to the discovery of finasteride, another main product in the arsenal to fight hair loss). In the 1988, UpJohn Corporation (now known as Rogaine) came out with a topical formulation of Minoxidil at 2%. In the 1990's, UpJohn's patent expired causing the price to come down due numerous generic forms of Minoxidil hitting the market. Rogaine subsequently came out with a 5% Minoxidil solution. Now some Clinics are offering 15% minoxidil to those who do not have satisfactory results with 5% minoxidil. Minoxidil stimulates hair growth in individuals with male & female patterned baldness (also hereditary hair loss, or Androgenic Alopecia) . However the mechanism of action is not known. We do know it does not affect the levels of DHT, which is how Propecia works. Most people believe Minoxidil works in part by partially enlarging the hair follicles and reversing the miniaturization process. By enlarging miniaturized follicles, the growth phase of the hair cycle is prolonged, allowing the hair to become longer and thicker looking. And with more follicles in the growth phase at the same time, it is possible to see improved coverage of the scalp. 3. Who can use Minoxidil? Minoxidil Topical Solution may be appropriate for you if you are an adult who is at least 18 years old and experiencing gradually thinning hair. 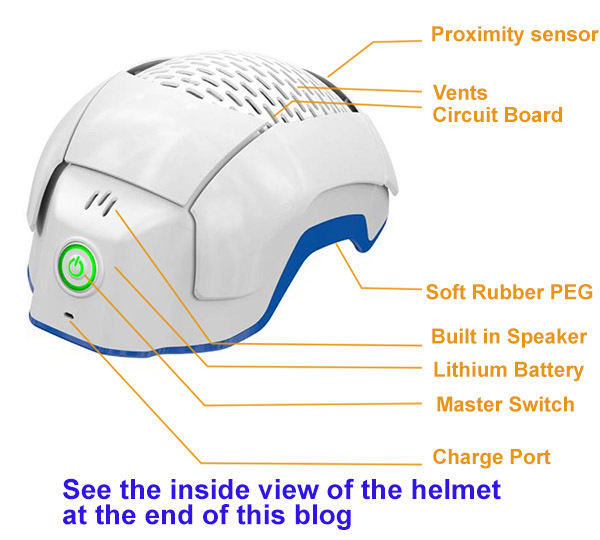 It works best for those who have the vertex/ crown hair loss. We have notice the minoxidil also works great for those who have diffuse hair thinning or frontal hair loss, particularly when the minoxidil product is enhanced with DHT blockers like finasteride and azelaic acid. 4. Who should NOT use Minoxidil Topical Solution? People with a history of hypersensitivity to any of the component of the preparation of the Minoxidil Topical Solution should not use it. People who are pregnant or nursing should not it. Minoxidil Topical Solution will not prevent or improve hairloss which may occur with the use of some prescription and non-prescription medications, certain severe nutritional problems (very low body iron; excessive vitamin A intake), low thyroid states (hypothyroidism), chemotherapy, or diseases which cause scarring of the scalp. Also, Minoxidil Topical Solution will not improve hairloss due to: damage from the use of hair care products which cause scarring or deep burns of the scalp. hair grooming methods such as cornrowing or ponytails which require pulling the hair tightly back from the scalp. You should ask your doctor if you are unsure of the cause of your hairloss. 5. How soon can I expect results from using Minoxidil Topical Solution? Since normal hair usually grows only 1/2 to 1 inch per month, hair regrowth with Minoxidil Topical Solution also takes time. Generally new hair growth is slow for a Minoxidil Topical Solution user. Continued use 2 times a day for at least 4 months is usually needed before you notice hair regrowth. If you do not see hair regrowth in 12 months, stop using Minoxidil Topical Solution and see your doctor. When you first begin to use Minoxidil Topical Solution, your hairloss may continue up to four weeks. This hairloss is temporary. 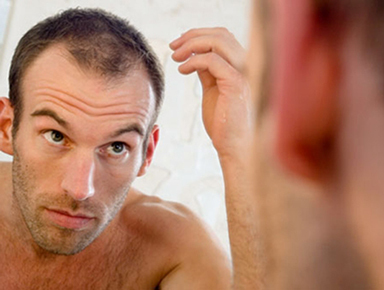 If you continue to lose hair after four weeks, see your doctor. 6. How long do I need to use Minoxidil Topical Solution? If you respond to Minoxidil Topical Solution, you need to use it 2 times a day to keep and continue the hair regrowth. Up to 12 months of use may be needed to see your best results from Minoxidil Topical Solution. 8. What if I miss a dose or forget to use Minoxidil Topical Solution? If you miss one or two daily doses of Minoxidil Topical Solution, just continue with your next dose. You should not make up for missed doses. 9. Can I use Minoxidil Topical Solution more than twice a day? Will it work faster, better? No. Minoxidil Topical Solution will not work faster or better if used more than two times a day. Studies have been carefully conducted to determine the correct amount of Minoxidil Topical Solution needed to get the best results. More frequent use or larger doses have not been shown to speed up hair growth and may increase your chance of side effects. 10. What are the most common side effects with Minoxidil Topical Solution? The most common side effects are itching and other skin irritations of the treated area of the scalp. Minoxidil Topical Solution contains alcohol, which would cause burning or irritation of the eyes or sensitive skin areas. If Minoxidil Topical Solution accidentally gets into these areas, rinse with large amounts of cool tap water. Contact your doctor if irritation persists. 11. What kind of shampoo should I use with Minoxidil Topical Solution? If you wash your scalp before applying Minoxidil Topical Solution, use a mild shampoo. It is best to use a mild ketoconazole shampoo such as Lipogaine shampoo. 13. Can I have my hair colored or permed or use hair relaxers while using Minoxidil Topical Solution? We have no information that these treatments change the effect of Minoxidil Topical Solution. However, to avoid possible scalp irritation, you should make sure all of the Minoxidil Topical Solution has been washed off the hair and scalp before using these chemicals. 14. Can I apply Minoxidil Topical Solution and wash my hair an hour later? No. For Minoxidil Topical Solution to work best, you should allow Minoxidil Topical Solution to remain on the scalp for about 3 hours before washing. 15. Can I go swimming or out in the rain? Yes, as long as you use good judgment. Avoid washing off the Minoxidil Topical Solution. If possible, apply Minoxidil Topical Solution to a dry scalp after swimming, or wait about 3 hours after application before going swimming. Do not let your scalp get wet from the rain after applying Minoxidil Topical Solution. 16. Can Minoxidil Topical Solution produce unwanted hair growth? Unwanted hair growth elsewhere on the body has been reported. This may be due to the frequent applying of Minoxidil Topical Solution on the areas of the skin other than the scalp. To prevent unwanted hair growth, limit the application of Minoxidil Topical Solution only to the scalp. 17. Can I use Minoxidil Topical Solution for baldness or hairloss in babies and children? No. Minoxidil Topical Solution must not be used to treat baldness or hairloss in babies and children. 18. Is 15% Minoxidil more effective than 5% Minoxidil? Yes, it is much more effective. Minoxidil is dose-dependent. The higher the dose of Minoxidil, the better the results. Using 15% Minoxidil does not give you faster results and 5%, but will cause the regrowth of more hair and thicker hair. 19. Is Topical Minoxidil safe? 20. Can both men and women use Minoxidil? Yes. There has been numerous studies showing Minoxidil causes clinically significant hair growth in both men and women. However, women is not recommended to use any minoxidil higher than 5%. 21. Can Minoxidil increase as well as maintain my hair count? In the studies conducted by UpJohn, 59% of men had some regrowth of hair at 12 months and it is at least as beneficial in women. Some men maintained their hair without growing new hair. Continuous use is necessary to maintain the hair gained by use of minoxidil. What happens if I completely stop using Minoxidil Topical Solution? 22. How long will it take for Minoxidil to work? Thick hairs have been seen as early as 4 months into treatment, but usually the full benefit from Minoxidil is not see for 12- 14 months. 23. How long do I have to take Minoxidil? 24. Does topical Minoxidil interact with other medications? 25. Is Minoxidil as effective as Finasteride (Propecia)? Minoxidil and Finasteride are two FAD approved product for hair loss treatment. They work by different mechanisms (Read the Minoxidil Review and Finasteride Review to know our detailed analysis of these two products). The success rate are similar between 5% minoxidil (twice daily) and 1 mg finasteride pill (once a day) . 26. Would using a topical Minoxidil solution in combination with Propecia® be more effective than Minoxidil alone? 27. How should I apply the Minoxidil solution? You should apply the 1 ML of Minoxidil solution via a "dropper" directly messaged in with your fingers to the balding scalp 2 times a day, once in the morning and once at night. We do not recommend to apply the Minoxidil solution by a "spray method" or a "dab method" because most of the solution does not get to the required location (i.e.-the skin and hair follicles), it just gets applied and dries on your hair, where it is not effective. 28. Is it true I might notice an increase in shedding of hairs following the initiation of Minoxidil? 29. If I place it on a wet scalp what will happen? Topical drugs actually penetrate the skin much more effectively when the skin is wet. Therefore, theoretically, Minoxidil potency would be increased. Please make sure that you skin is just wet, not with drops of water. Otherwise the water will change the composition of the minoxidil product and make it more difficult to be absorbed. 30 .Instruction for use of Applicator (drooper). The dropper can be useful for a broad range of hair styles or hairloss because it allows for easy application through the hair and directly onto the scalp. a). Squeeze the rubber bulb and insert the dropper into the bottle. Release the bulb, allowing the dropper to fill to the 1 mL line. If the level of the solution is above the 1 mL line, squeeze the extra amount back into the bottle. b). Next, place the tip near the part of the scalp you want to treat and gently squeeze the bulb to gradually release the solution. To prevent the solution from running off the scalp, apply a small amount at a time. c). If you have large area you need to cover and 1 mL is not sufficient, you can alternate the areas where the solution is applied. keep in mind the solution will diffuse once it is absorbed. It is not necessary to cover your entire area you want to treat each time. You may know the story how Viagra was accidentally discovered for treating erectile dysfunction by scientists at Pfizer Laboratories. Originally, sildenafil, the active drug in Viagra, was tested in clinical trials for its ability to lower blood pressure. What the investigators found during those trials is that people didn't want to give the medication back because of the side effect of having erections that were harder, firmer and lasted longer. Minoxidil, the no.1 hair loss treatment product, is another example of accidental discovery. Minoxidil was initially used as an oral medication to treat high blood pressure. As an arteriolar vasodilator, Minoxidil’s primary function is to dilate potassium channels. As shown in the diagram below the piperidinopyrimidine derivative molecule, has a chemical structure of 2,6-diamino-4-piperidinopyrimidine 1-oxide. While minoxidil is effective in lowering blood pressure, it was found to have an unexpected side effect of hypertrichosis, or abnormal hair growth in 24%-100% percent of patients using minoxidil—even 5 out of every 6 children prescribed oral minoxidil experienced abnormal hair growth. What made these findings more interesting, is that the hypertrichosis was more apparent in women than in men, even at low doses. While hormonal imbalances and abnormalities were not found with the use of minoxidil, long-term oral use was found to cause darkening of the skin and coarsening of facial features. While hypertrichosis was evident, it was not officially reported in the world of dermatology until 1979. It was also in 1979 that the oral tablet form of minoxidil, (Loniten) was approved by the FDA for the treatment of hypertension. The introduction of Loniten had many dermatologist considering the oral tablet to assist with treating a variety of different forms of hair loss. However, there were some concerns, as oral minoxidil could lead to an unhealthy drop in blood pressure for those who were taking it only for treatment of hair loss, and not for treatment of high blood pressure. Another side effect some patients experienced when using oral minoxidil was severe water retention accompanied by weight gain—which prompted the need for a diuretic. Zapacosta also reported a reversal of AGA (Androgenetic Alopecia,or Pattern Hair Loss) in patients taking minoxidil. In an effort to create an effective alternative to oral minoxidil, several researchers begin testing formulas for a topical version. The findings were encouraging, in two controlled studies utilizing 1% topical minoxidil for patients suffering from alopecia areata—50% demonstrated regrowth. In 1984 another study was done for the treatment of AGA. The study was conducted with 15 patients, 5 of who had AGA, and 10 who had AA. Patients were randomly given either a placebo or a 1% or 5% minoxidil topical treatment—and the results were again encouraging. The 3 AGA patients that received the 5% topical minoxidil experienced regrowth. However, in this study none of the patients with AA experienced regrowth. Minoxidil blood levels were comparable between both the AA patients and the AGA patients at .5, 2.0, and 4.5 ng/mL 2 hours after application to the scalp. Since the initial studies for oral and topical treatment of minoxidil for hair loss, a significant amount of further research has been done to help dermatologists understand how minoxidil can successfully be used to stimulate and increase hair growth. One hypothesis that has led to more modern treatment is based on the vasodilatory properties that minoxidil possesses. This led researchers to look at other potassium channel dilators, such as Diazoxide, that help with increasing blood flow—as well as stimulating and increasing regrowth. In a Laser Doppler velocimetry study using 1%, 3%, and 5% topical minoxidil on 16 balding men—there was an increase in cutaneous blood flow across the board. The group with the greatest increase of cutaneous blood flow was the 5% group, and the increase could be detected as quickly as 15 minutes after the topical minoxidil solution was applied. The increase was apparent for up to 1 hour after application. Further studies show that minoxidil increases the vascular endothelial growth factor mRNA in human hair dermal papilla cells. It is the conversion of minoxidil to minoxidil sulfate that stimulates hair follicles, resulting in regrowth. Minoxidil is converted to minoxidil sulfate by the sulphotransferase enzymes found in the scalp [To find out why using minoxidil sulfate in a hair loss product is not a good idea, please read here]. In a study of balding scalp skin, performed on the stump-tailed macaque, sulphotransferase enzymes in hair follicles can be found at 50% to 85% compared to only 10% to 20% in the dermis and epidermis. Additional immunolocalization studies have found that the deeper inner root sheath allows the conversion to the sulfate form to achieve a higher conversion rate. Since each patient’s enzyme conversion rate is different, it affects the success rate of the topical minoxidil. Patients who have higher enzyme conversion are found to have a greater level of success and hair growth. Human epidermal cells treated with minoxidil have a longer life cycle than controlled cultures. It is believed that minoxidil has the ability to slow the rate in which the germinative pool and senescence of keratinocytes are diminished by improving and increasing the proliferation of dermal papilla within the hair follicles, both regrowth and elongation of hair follicles is achieved. Minoxidil also prevents the rate at which cells die by increasing the rate of Erk and Akt phosphorylation. Minoxidil has also been found to increase the rate in which new cells are developed. Since the conversion of tritiated minoxidil to tritiated sulfate occurs at a more rapid rate in hair follicles on the scalp than it does in other areas of the body. DNA synthesis is enhanced in hair follicles and perifollicular cells with the use of minoxidil. A study showed that there was a peak that occurred in minoxidil cultured cells 8-10 days after exposure. These findings show that minoxidil can alter the growth pattern of cultured epidermal cells, as well as the phenotypic appearance. One matter that has still not been determined is whether minoxidil prolongs anagen or simply shortens telogen. What makes this difficult to determine is varying study results. A study performed on rats showed that the anagen phase was indeed prolonged. However, a similar study performed on balding stump-tailed macaques showed a reduction in the number of telogen follicles, as well as an increase in the overall size of hair follicles. The study on the macaques suggested a chronological change from telogen to anagen. A third study performed on balding men over a 12 month period supported an increase in anagen/telogen ratios, but the findings primarily showed an increase in hair diameter which was apparent 4 months into the study. A 12 week study found an increase in baseline shaft diameter by close to twice what it was at the beginning of the study, with a slight decrease in shaft diameter 24 weeks into the study. Another benefit that minoxidil may provide is improving the function of hair follicles as an immunoregulatory role. A series of in vitro studies found that there is sometimes a suppression of T-lymphocytes when using minoxidil. This helps to explain the success of minoxidil treatment for AA patients. While the primary focus of many studies has been elsewhere, many have found that minoxidil can reduce perifollicular infiltrate and selectively inhibit prostacyclin production. It has even been found to have an aspirin-like effect which prevents the grouping of platelets by decreasing the synthesis of prostaglandin E2 and thromboxane B2. What is yet to be studied is the inhibitory effect on the cyclooxygenase enzyme. While there has been a wide range of studies to help determine the exact role that minoxidil plays in both regrowth and elongation, there is solid clinical evidence that topical minoxidil is indeed effective as shown in Table I below. When it comes to measuring the success of hair regrowth treatments made with minoxidil, there are some built-in challenges. The success of many studies is often determined by the patient’s personal assessment, or by a somewhat unquantified assessment by the researcher. Some studies rely on third party reviewers to achieve less biased findings—however, those rely heavily on photographic images, which can also be difficult to quantify. In some studies quantifiable results are determined by counting individual hairs, and determining hair weight. Some studies even utilize stereotactic equipment or tattoos to monitor results. Regardless of the method in which findings are measured, standard procedures, extreme attention to detail, and timely documentation are a must. Even the concentration of minoxidil used for topical treatment was a topic of debate for years. In Table II below you can see the timeline of different concentration of minoxidil over the years. Rogaine is a trademark of Pfizer, Inc (New York, NY). In a 5 year clinic study, it showed that 31 men using 5% percent saw a peak in new growth approximately 1 year in, then a gradual decline. However, the regrowth they initially achieved remained for 4.5-5 years. 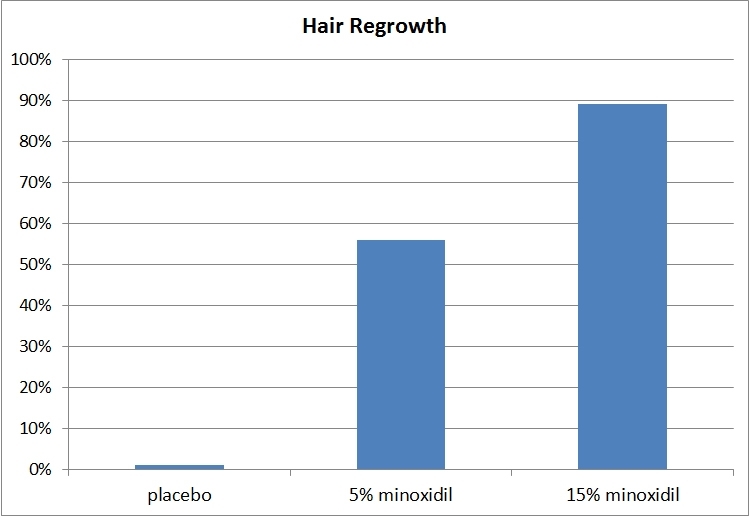 In studies utilizing topical minoxidil at 2% and 5% found that there was a drastic statistical increase in the weight of the hair, compared to those using a placebo. The study that found the increase in the weight of the hair, was done with a group of 36 men, split into 4 different groups receiving either 5%, 2%, vehicle alone, or placebo. 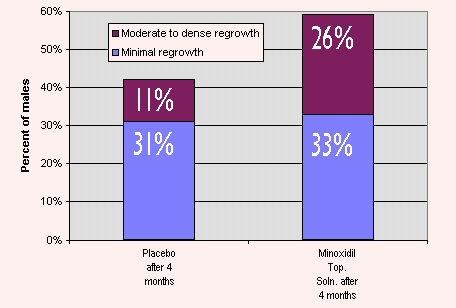 In another placebo controlled study using a 2% solution, 5% solution, or placebo—men using the 5% solution experienced 45% more regrowth 48 weeks into the study. Women in the same study experienced regrowth with both the 2% and 5%, but the difference in regrowth between 2% and 5% was not significant. However, those using the 5% experienced more side effects than those using 2%, such as pruritus, irritation, and hypertrichosis. In an effort to broaden the range of minoxidil products on the market, 15% minoxidil products were recently developed. In a placebo, and 5% minoxidil controlled study with 15% minoxidil product, 56% subjects using 5% minoxidil had regrowth, while 89% subjects using 15% minoxidil had regrowth. Early studies showed vellus hair growth in 2 individual cases of Alopecia Arenta (AA) that were treated with a 1% topical solution—the findings were not enough to gain FDA approval. A larger placebo controlled study with a total of 30 AA patients showed that 16 out of the 30 patients with AA responded to the minoxidil solution better than those with alopecia totalis or universalis. A less extensive AA study conducted for first time episodes of AA, found an 80% rate of regrowth, 50% of which was significant. Studies performed on severe cases of AA, find significantly less success. Patients with severe AA who have participated in clinical studies tend to only experience soft, vellus hair regrowth. What makes the success results with these findings even less impactful, is that once the minoxidil solution is discontinued, the regrowth is lost. There are as well some inconclusive findings from conflicting studies that demonstrate reduced T-cell infiltration and reduced perifollicular infiltration. It is still yet to be determined if minoxidil has a temporary, lasting, or even any immunosuppressive effects at all. Sometimes the best treatment solution is to combine treatments such as utilizing a minoxidil solution after a hair transplant surgery for patients with AGA. The findings of 2 separate uncontrolled studies showed that the perioperative shedding that traditionally occurs a week or two after a hair transplant was nearly eliminated when combined with minoxidil application. They also found that regrowth speed accelerated from the typical 6-8 months, down to only 1-2 months. These findings were then confirmed in a double-blind clinical trial with 12 male AGA hair transplant recipients. They began using either a placebo or a 2% minoxidil. The men using the 2% minoxidil solution both 6 weeks prior to the transplant and 17 weeks thereafter, experienced drastically less hair loss during the traditional perioperative shedding period. Eleven well-respected hair transplant surgeons from around the world sat down for a roundtable discussion. Most of these surgeons relied on minoxidil as their primary treatment, not only for hair transplant patients, but for any patient experiencing hair loss. They expressed that topical minoxidil not only assists with regrowth, but in minimizing and stabilizing hair loss, and increasing both hair density and hair weight—which also makes transplanting easier. It also decreases postop telogen effluvium and increases hairs during the anagen phase. While the majority of transplant surgeons prescribed a minoxidil solution several weeks prior to hair transplant surgery, most agreed that it was best to discontinue treatment 2-3 days prior to surgery to lessen the risk of intraoperative bleeding, and skin irritation. Most surgeons advise their patients to wait 1-2 weeks before beginning treatment again to allow epithelium time to heal and restart again. Few of these 11 surgeons patients experience side effects when using a minoxidil solution, and most patients have the best success with the 5% compared to that of the 2%. While initial studies led many to believe that minoxidil was not effective in preventing chemotherapy induced alopecia, the initial studies simply were not long enough to measure success. In a clinical study conducted with breast cancer patients during the entirety of their chemotherapy treatment, and 4 months post-chemotherapy, a significant decrease in the duration of the chemotherapy-induced alopecia was measured. In this study a 2% solution minoxidil was used, and the study found that initial hair loss was delayed by up to 10 days, and increased regrowth time by up to 40 days. For patients who experience hair loss due to their hairstyles or repetitive pulling on their hair, a minoxidil solution can be used to speedup regrowth. In a study done on one 45-year-old African American, and one 54-year-old African American—their regrowth improved significantly within 3 to 9 months of treatment. While this type of hair loss is often treated with steroid injections, treating with a minoxidil solution, especially in the early stages, can greatly improve regrowth time. A minoxidil solution is often used for long periods of time. To gauge the absorption rate of topical minoxidil a study was performed on patients who applied either 1% or 5% solution, 2 times daily. The results showed an systemic dose of between 2.4 to 5.4 mg/day. For patients who apply minoxidil solution to areas smaller than a fully bald head, systematic levels were either undetectable, or as low as 0.4 to 7.5ng/mL. Within 3-4 hours of application the minoxidil levels are less than half, and it is estimated that minoxidil entirely clears the body within 12-20 hours if not reapplied. While the goal of using a topical minoxidil solution, is to encourage regrowth in the hair on your head—a common frustration is that it can result in hair growth in other areas. This is primarily a problem when using oral minoxidil—however, the systemic absorption of the topical version can also lead to unwanted hair growth in other areas of the body. In a placebo controlled study involving 1333 female patients, 4% of the patients using between 2% to 5% minoxidil experienced unwanted hair growth. In another study 8.9 percent of women experienced unwanted hair growth on both their face and limbs when treating their AGA twice daily with a 5% topical minoxidil solution. The unwanted hair growth can be found on the arms, legs, face, and sacral area. The unwanted hair growth is more common in women utilizing minoxidil for hair loss—however, some medical professional believe that the unwanted hair growth is not less common—only more noticeable due to the fact that women traditionally have less body hair than men. As a result, many physicians begin their female patients with a 2% topical minoxidil to see what the side effects may occur. It is also believed that ethnicity may play a role in the severity of the unwanted hair growth. Another common side effect of minoxidil is skin irritation directly on the areas which it is applied. One study showed that 4 patients out of 149 had allergic reactions or skin irritation. This skin irritation is not always severe enough to discontinue treatment, but in rare cases can lead to seborrheic dermatitis—however, contact dermatitis is more likely. Whether it is the minoxidil or the propylene glycol that causes the irritation is unclear. One study showed that a solution made with butylene glycol instead of propylene glycol caused less irritation. Patch testing is often advised when using a minoxidil solution. Sometimes lowering the dose can resolve the irritation, itching, dryness, or erythema. The foam version of many minoxidil solutions does not contain propylene glycol, which lessens the likelihood of irritation—while maintaining the overall product effectiveness. For the rare patients that are allergic to minoxidil, they may not be able to use any formulation regardless of it being oral, topical, or foam. As with many prescriptions, is not recommended to use minoxidil while pregnant or nursing. While one study conducted over a 12 month period showed no adverse effects, there is concern of fetal malformations which have occurred sporadically by women using minoxidil who were not undergoing a study or clinical trial. The concern is that the concentration of minoxidil that is passed along to the fetus after it accumulates into lipids, is a cause for concern. One women utilizing minoxidil while pregnant, gave birth to a child with hypertrichosis, dysmorphic facial features, partial clinodactylism, cryptorchidism, and omphalocele—however, she was also taking 3 other hypertension medications while pregnant. In this case the unwanted hair growth disappeared after birth. Another woman utilizing oral minoxidil gave birth to a baby with extreme vessel transposition and pulmonary valve stenosis—unfortunately the baby did not survive. There have also been other reports of women using topical minoxidil and experiencing a multitude of birth defects such as hypertrichosis, caudal regression syndrome, vascular malformations, hemorrhages in the brain, and CD34 and CD31 immunoreactivity. While it is not conclusive if these were isolated incidents, or the result of the minoxidil solution, it is important to discuss the use of either the oral or topical treatment if you are pregnant, nursing, are planning to get pregnant. Hair loss does not occur overnight, nor does hair regrowth. It typically takes 3 to 6 months to see apparent hair regrowth with minoxidil products. A lot of people make the mistake of stopping using the products after trying it for one or two months when they don’t see improvement. And there are also people who get panicked after seeing increased hair loss when they start using minoxidil products and stop the treatment. One should be aware that it is normal to see increased hair loss (shedding) upon using minoxidil products. It means the product is actually effective. It stimulates your scalp to grow new hair, which will cause the old, thinner hair to shed in order to make way for the new hair (read more on Minoxidil Shedding here).